The Kansas City Royals have announced today that the club has signed right-handed pitcher Jeff Suppan to a minor league contract for 2011. 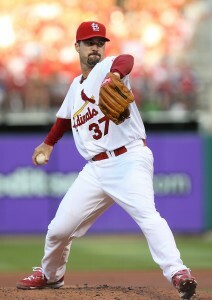 Suppan will report to Triple-A Omaha. Suppan, 36, pitched for the Royals from 1998-2002, compiling a 39-51 record with a 4.73 ERA, leading the team in wins from 1999-2001 and serving as the club’s Opening Day starter from 2000-2002. The 6-foot-2 right-hander spent 2010 with the Brewers and Cardinals, going 0-2 in Milwaukee before posting a 3-6 record with a 3.84 ERA in 15 outings (13 starts) for St. Louis. A veteran of 16 Major League seasons with the Red Sox (1995-97, 2003), Diamondbacks (1998), Royals (1998-2002), Pirates (2003), Cardinals (2004-06, 2010) and Brewers (2007-10), Suppan is 138-143 with a 4.69 ERA in 442 career appearances, including 411 starts.